For the past several years, the United Nations has served as a platform for Syria’s enemies to air allegations of human rights abuses and even attempts to use such allegations to justify military aggression against Syria itself. Tales of “barrel bombs” being used against civilians, the bombardment of enemy positions at the cost of civilian lives and the destruction of vital infrastructure have all been constructs in the West’s narrative against the Syrian government. Now that the US is itself bombing Syria, killing Syrians including innocent men, women and children, as well as vital infrastructure local populations depend on for their survival, the UN has grown suddenly quiet. The Western press too seems to have reverted to its observance of the notion of “collateral damage.” Suddenly, the very terrorists the Syrian government has tried to warn the world about for years as it fought them in its city streets and countrysides, are now bad enough for the end of defeating them to justify the means of occasionally killing civilians, so long as they are killed with US rather than Syrian weapons. The startling hypocrisy combines with the fact that Syria’s military is operating within its territory, conducting security operations to secure its own borders and all territory within it, while the US is operating thousands of miles from its own shores, in a foreign country, with both a doubtful pretext and an even more doubtful agenda in mind as it does so. Where is the United Nations? The airstrikes in Syria carried out by the US, Persian Gulf states, and several European nations are done so without the Syrian government’s approval, no recognized opposition party has approved of them, and certainly no UN resolution has provided the West with a mandate to exercise military force inside of Syria. On this point alone, the UN should be standing up in vocal protest, leveling sanctions against those participating in this act of unilateral, illegal military aggression. Additionally, the UN should be speaking out against the loss of civilian lives, just as it did during the past several years of chaos in Syria’s ongoing conflict, as well as preparing monitoring teams and investigations into the impact of these attacks. 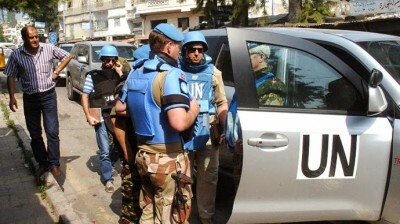 Aside from Syria, there is another battlefield the UN is suspiciously absent from. Ukraine. In Ukraine, Kiev has been carrying out increasingly atrocious campaigns of violence against its own people. As it steadily loses control over territory in the east of Ukraine, grisly scenes of mass murder, torture, and extrajudicial executions are being uncovered. Yet there is no protest voiced within the UN, no teams being mobilized to investigate unearthed crime scenes and no measures taken against the perpetrators which include ultra-right wing militant groups espousing modern-day Nazism like the notorious Right Sector. While some may claim such accusations are merely “Kremlin propaganda,” it is the West’s own Organization for Security and Co-operation in Europe (OSCE) which provides daily reports from its own monitors on the ground inside Ukraine, that have mentioned the presence of right-wing militants, their destruction of Ukraine’s historical heritage, their attacking and harassing of their political opponents and violence they are carrying out across the country, from eastern Ukraine to the capital of Kiev itself. Recently OSCE reported that the Neo-Nazi Azov Battalion, which literally flies a flag featuring Adolf Hitler’s SS Wolfsangel insignia on it, led mobs in the dismantling of a statue of Vladimir Lenin in the Ukrainian city of Kharkiv. Another OSCE report noted that Right Sector was leading mobs in Odessa. An earlier OSCE report from August would admit another Kiev “volunteer battalion” similar to Azov and Right Sector, the so-called “Aidar Battalion,” was at the center of several human rights abuses and in particular, the abduction, torture, and holding for ransom of eastern Ukrainians. Clearly there are abuses taking place, carried out by overtly abhorrent extremist groups espousing ideology illegal throughout most of Europe, but supported by the European Union, NATO, and the United States. Why the UN has remained silent on this while so vocal on other issues raises serious questions about its objectivity and impartiality. While in theory the UN is supposed to be an impartial arbiter of international law, through clearly biased actions it is revealed to be a subject to certain special interests, merely using the pretext of human rights and international law to selectively advance the agenda of certain member states while ignoring entirely such principles when convenient. Likewise, in Ukraine, where ultra-right militants espousing Nazism are openly carrying out human rights violations so often and overtly that even the European-aligned OSCE must report them all while the UN remains utterly silent and flaccid, undermines not only the UN itself, but the concept of international law altogether. Eastern Ukrainians, the Syrians and all their respective allies are left with little other choice than to act unilaterally themselves to defend their territory and people as well as their interests in the face of rogue nations that have apparently co-opted and now control much of the UN.